Cairo real estate is available here. Browse Cairo, Cairo real estate and home listings at cairoproperty.net. 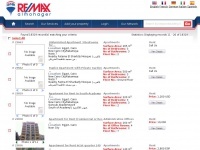 Cairoproperty.net provides information about a product. The web server with the IP-address 85.195.89.161 used by Cairoproperty.net is run by velia.net INternetdienste GmbH and is located in Germany. On this web server 11 other websites are hosted. The language of those websites is mostly english. A Apache server hosts the websites of Cairoproperty.net. The website uses the latest markup standard HTML 5. The website does not specify details about the inclusion of its content in search engines. For this reason the content will be included by search engines.